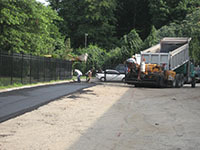 With over 25 years experience, we can help you maximize your pavement dollars. No other company in NJ gives a more efficient quote. From start to finish, you will be happy. Typically the winter months of December 20th – March 15th are off-peak for asphalt, concrete and pavement maintenance services. In the Mid-Atlantic market the temperatures historically fluctuate between below freezing and above freezing throughout the winter months. These temperature fluctuations wreak havoc on asphalt and concrete through the constant expansion and contraction of asphalt & concrete substrates from the freeze/thaw cycle. Our asphalt division is available for all your asphalt repair, recycling, drainage, catch basin repair and paving needs. 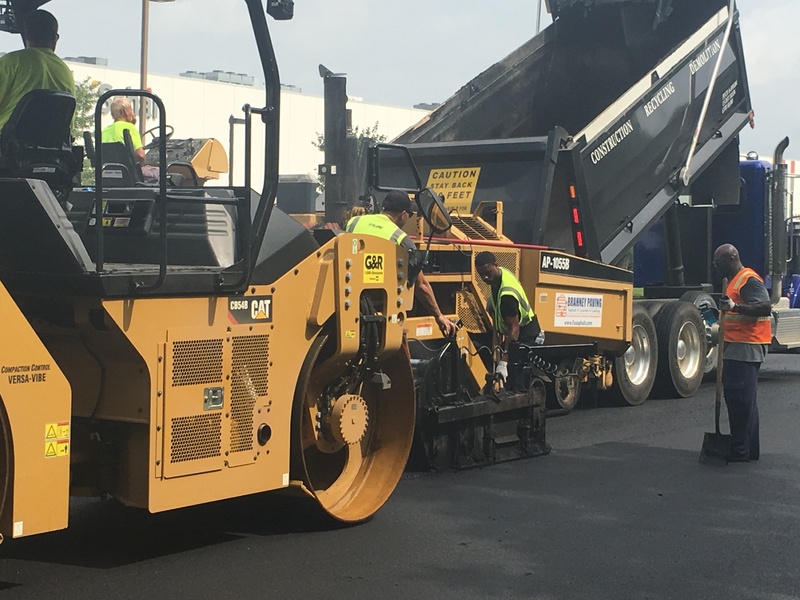 Our asphalt division handles projects as small as single pot repairs and up to a 3,000 ton resurfacing projects. In addition, our in-place recycling services can not only help you earn LEED points, it can also help you save valuable budget dollars. For a more in depth review of all our services listed on this page, please visit the specification library in our (hyperlink to pavement page) section of our website. 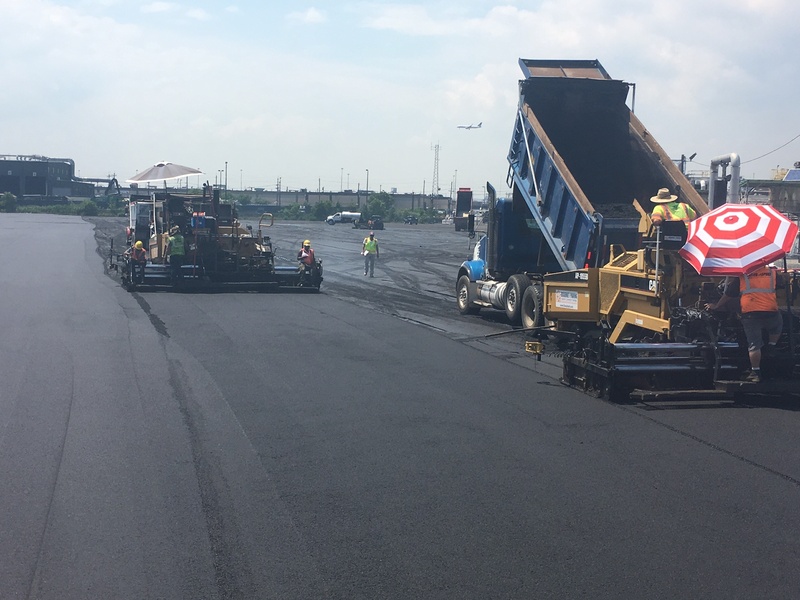 Asphalt concrete, normally known simply as asphalt or (HMA) hot mix asphalt, is a composite material commonly used for construction of pavement, highways and parking lots. 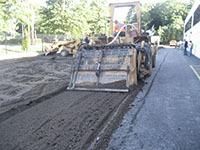 It consists of asphalt binder and mineral aggregate mixed together then laid down in layers and compacted. 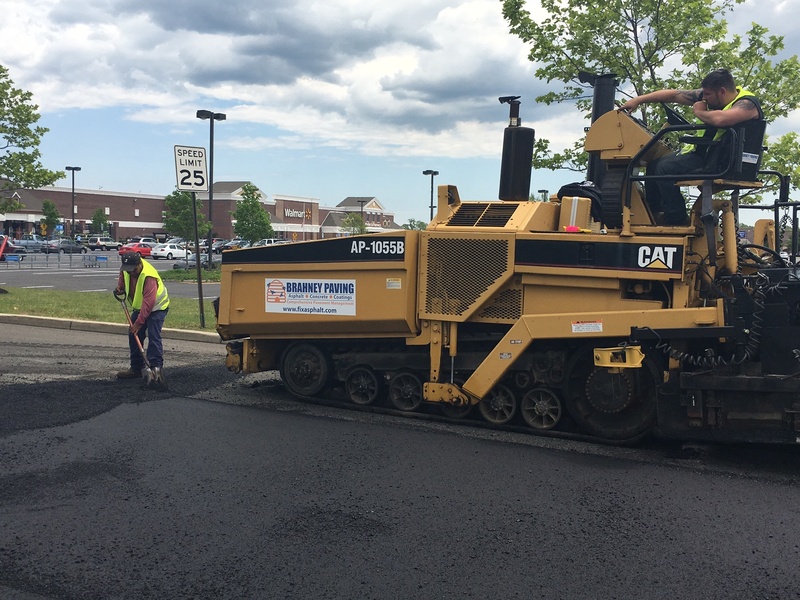 1/2” Surface Mix/Structural Overlay (Used for high traffic parking lots, medium truck areas, when budgets are tight, and a 2” – 3” full depth patch or mill and replace project is being completed). 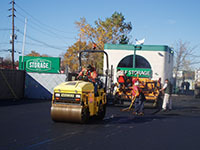 An asphalt overlay usually installs a 2” compacted mat of asphalt with either 3/8” stone or 1/4” stone. Resurfacing varies on the parking lot surface. For example, if you have an overlay that needs to be performed on a high-traffic parking lot and the lot needs to remain open during resurfacing, we may use a 1/2” mix. We would use this larger mix in the asphalt to reduce power steering marks and possible shoving of the mix in turn lanes while still tender. 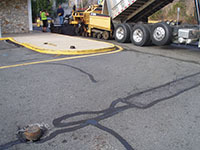 Pot Holes- Prior to installing the asphalt overlay, all pot holes should be square-cut, excavated to the stone base and repaired with a base mix asphalt (3/4” stone). Rutting / Areas Of Standing Water / Heaving- Prior to installing the asphalt overlay, all rutted areas and areas of standing water should receive a leveling course to remove surface imperfections. If a parking lot is very old and has many areas of small puddles or waviness, a 1/4” leveling course should be applied to the parking lot to bring the surface to a 100% level grade. Any heaved or raised areas should be cut down with a milling head or jack hammer to prevent resurfacing through the new asphalt overlay. If the heaved area is due to frost, it is advisable to excavate the area to a depth of 18” – 24” and install clean stone to prevent future heaving. 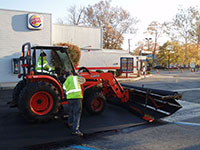 Geotextile paving fabric is the single most cost-effective preparation item that can be installed. Studies by the Federal Highway Administration have shown, having a geotextile fabric install prior to resurfacing can reduce reflective cracking by 80% over the life of a 15-year overlay. Paving Fabric also provides a moisture barrier preventing water from pumping to the surface from hydrostatic pressure. 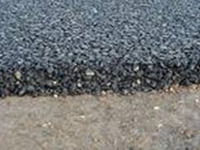 Depending on the severity of alligator cracked areas, heaving and rutting, you may want to address the areas with either full depth reclamation (4” – 6” ) and install Binder Asphalt (3/4” stone) prior to installing the fabric or if budgets are tight, mill down 2” and install 2” of Binder asphalt (3/4”) stone. Most asphalt overlays are installed improperly and usually do not last 2 years before the cracks resurface into the new asphalt. This is not the fault of the property manager, but rather the contractor. Some contractors, being full aware of the additional services available to strengthen an overlay do not recommend them because they become involved in local or national “price-wars” and do not want their bid to be higher than the others. For instance, if you install a 2” average overlay over alligator-cracked pavement or large cracks, those same cracks will reflect back through the new overlay at an average rate of 1” per year. In effect, after 2 years, your new parking lot will resemble the same crack patterns and areas of deficiencies that the old parking lot had. How would you feel if you just spent $150,000.00 to overlay a parking lot and in 2 years it looks the same as it did prior? You would probably be pretty frustrated. The truth of the matter is that there are several technologies and processes that are available to prevent this from happening; however, finding a contractor who will recommend them will be similar to finding a needle in a haystack. Do you see why spending an additional $0.20 sq ft up front will save $0.43 sq ft over a 15 yr period? At minimum, a parking lot needs to be crack sealed prior to installing an asphalt overlay to defer reflective cracking for 3 – 5 years. 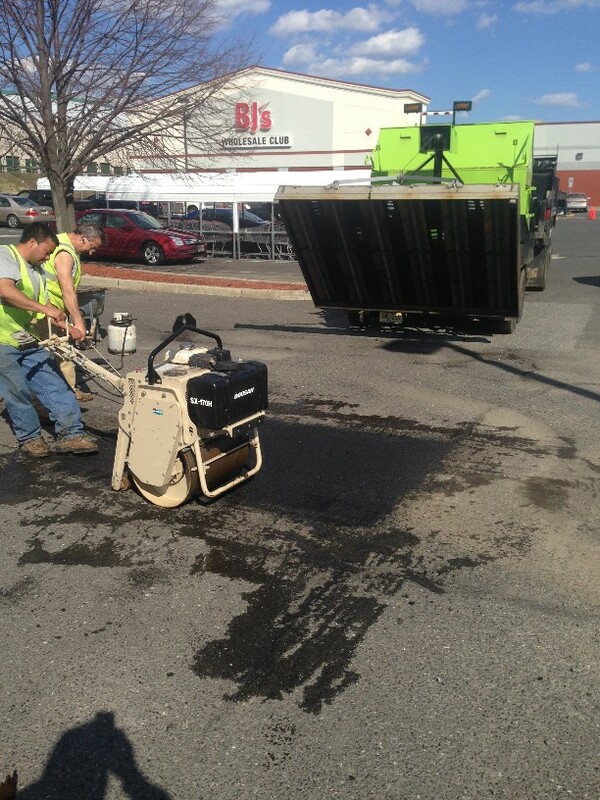 Pulverization and In-place recycling is a cost effective alternative for asphalt parking lots that may have areas of base failure or elevations that are too high to allow another pavement overlay. In-place recycling is useful for a situation where there is moderate – excellent sub-base material currently in place (i.e. : 6” – 12” of solid stone base) and a thin layer of asphalt (1 ½” – 3”) currently in place. Pulverizing is a recycling process that grinds existing asphalt in place in a single pass and blends it with the underlying materials to form a quality base material. Reuse of existing materials eliminates disposal problems. Reduction in costs over hauling off asphalt and importing granular fill or ABC. 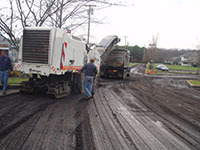 When deteriorated asphalt pavements are recycled in place, a technique known as full-depth reclamation can be used. The flexible pavement and a pre-determined portion of the underlying base material are milled and pulverized to a depth ranging from (6 to 12 inches) or more. The pulverized material is mixed within the reclaiming machine while stabilization reagents (such as lime or portland cement and fly ash) and water are introduced and blended with the pulverized recycled paving aggregate. The reclaimer is then followed by grading, spreading, and compaction equipment working in the same manner and sequence as if plant-mixed PSM material were delivered and placed at the project site.